Florence, Palazzo Pitti, inv. 1912, no. 249 [49?]. Costamagna, 1994, 279, no. A24, Fig., with full bibliography, as not by Pontormo. 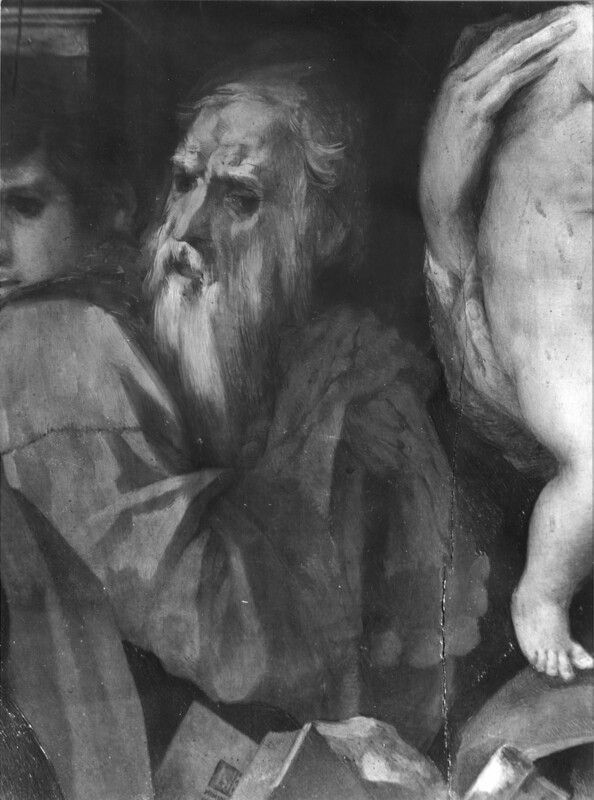 Falciani, Carlo, “Un ritratto del Rosso Fiorentino,” Commentari d’Arte, 3, 1996, 29-32, Fig. Falciani, Carlo, in L’officina della maniera, 1996, 352, no. 130, 353, Color Plate, with Pitti inventory no. 49, as by Rosso, around 1521-1522. According to Falciani in 1996, the Pitti inventory of 1815 recorded an attribution to Bronzino. In 1828, Francesco Inghirami described it as a work by Pontormo and it was included as his in a series of prints by Bardi of works in the Pitti and in all subsequent guidebooks of the 19th century. 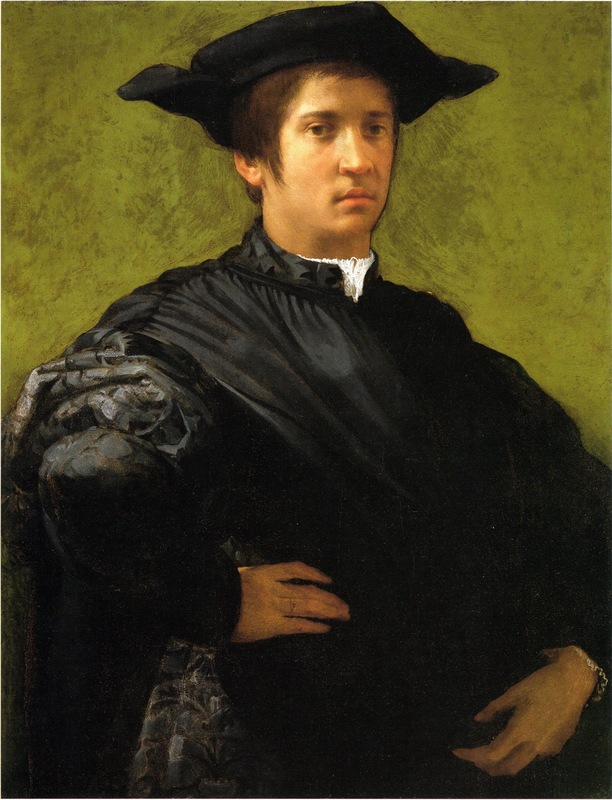 In 1901 Schaeffer published it as by Pontormo and as a portrait of Francesco da Castiglione upon seeing a resemblance to this Florentine in Vasari’s fresco of 1562 of the Entry of Leo X into Florence in 1515, where the figure wears a prelate’s hat, not the black beret of the portrait. In 1964 Cox-Rearick (151 and n. 42, as Pitti, no. 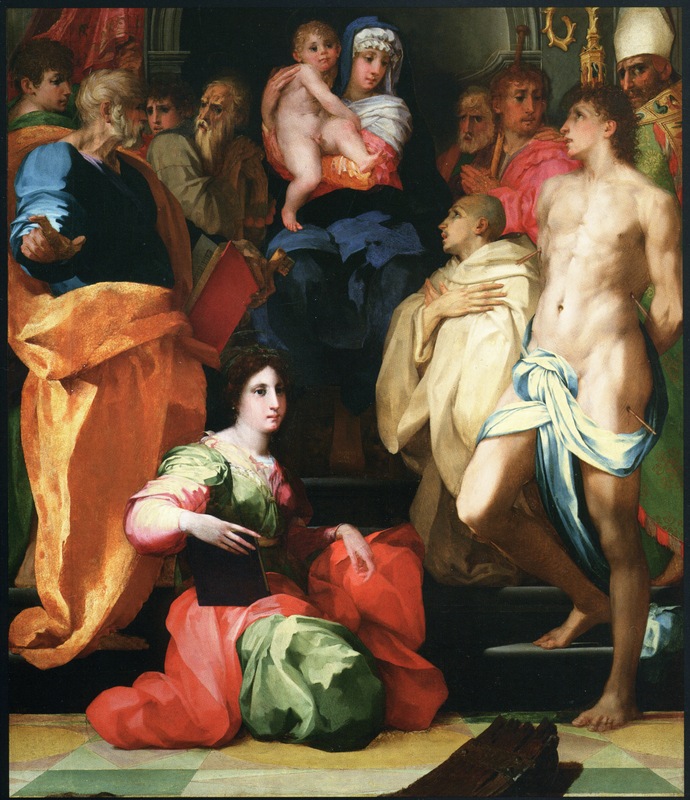 249) and Foster1 were the first to take it from Pontormo. Costamagna also dismissed it as Pontormo’s, suggesting, in relation to its identification as Francesco da Castiglione, that it is by one of Vasari’s assistants on the execution of the 1562 fresco. 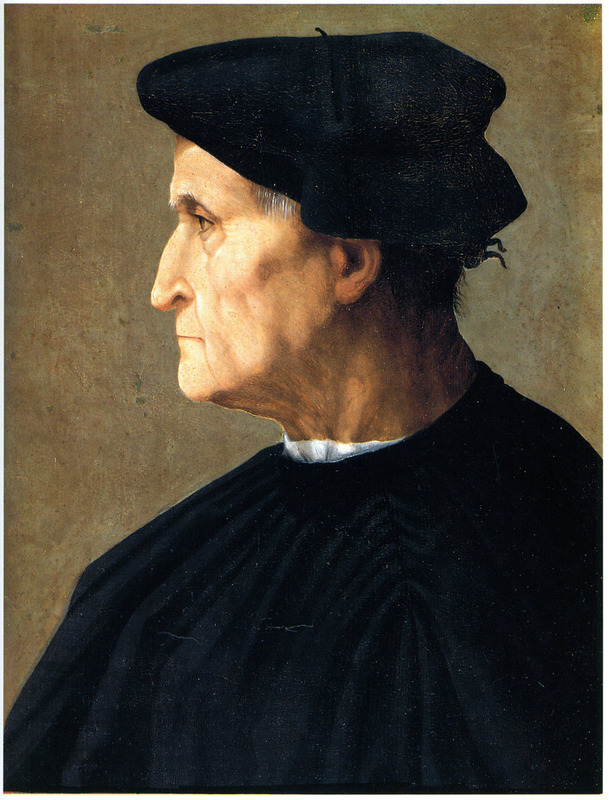 Already in 1966 Berti recognized its relation to early quattrocento Florentine profile portraits, which led him, and Marco Chiarini and Falciani, after the cleaning of the painting, to the same conclusion that the portrait is by Rosso Fiorentino and datable around 1520-1521. I know the portrait only from what seems to be a fine color reproduction in Falciani’s 1996 publication of it. Falciani supports the attribution with a quotation from Vasari’s characterization of the heads of the saints in the Dei Altarpiece as extravagant because of “l’astrattezza delle attitudini, non più usata per gli altri.” He does not, however, make any direct comparisons with any heads in that painting, which are, in fact, remarkably “extravagant” in the spontaneity of their execution unlike the usual finish of the works of others. But this I do not find at all in the Pitti profile portrait. In 1966 Berti recognized the source of the image in quattrocento profile portraits, making it possible to conclude that the painting is a repetition of such a portrait brought up to date by the subtle modeling of the face and the finesse of the execution of wisps of hair. This greater plasticity may also have been visible in the black beret and garment but is no longer apparent. What this very finished portrait does not show is any of the vividness of the saints’ heads in the Dei Altarpiece brought about by the liveliness of their execution (see Fig.P.12f). Nothing about the portrait compels me to recognize Rosso as its author, either compared to Rosso’s three wholly accepted portraits in London (Fig.P.6a), Washington (Fig.P.8a), and Naples (Fig.P.21a), or to any of the saints’ heads in the Dei Altarpiece (Fig.P.12a). 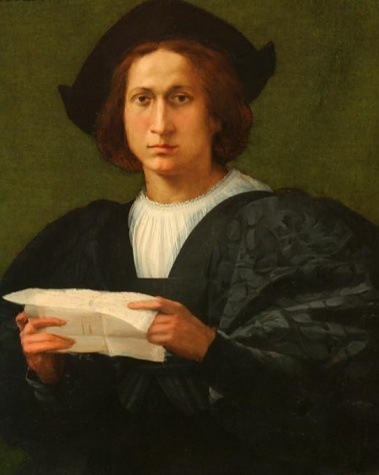 I have not been able to discover how Schaeffer’s identification of the man as Francesco da Castiglione (d. 1484) can be reconciled with the figure in Vasari’s fresco that shows an event that took place in May of 1515. The text accompanying Bardi’s 1842 print of the picture identified him merely as a Florentine merchant and Clapp in 1916 thought that Schaeffer’s suggestion was only conjectural. 1 Foster, K.W., “Problem um Pontormos Porträtmalerie (I),” Pantheon, XXII, 1964, 376-384.